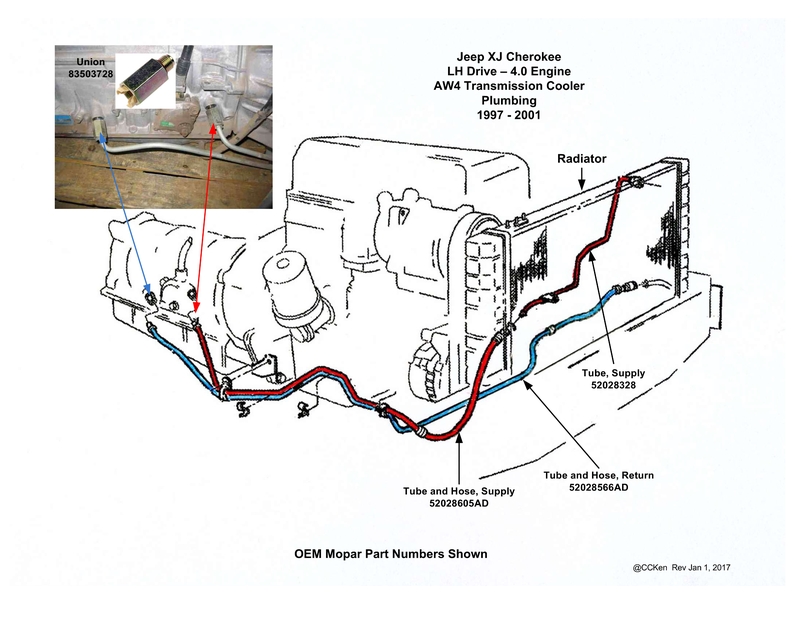 Below is a guide for the 1988-1996 and 1997-2001 Cherokee XJ AW4 transmission oil cooler plumbing. Last edited by CCKen; 02-15-2017 at 08:10 AM. 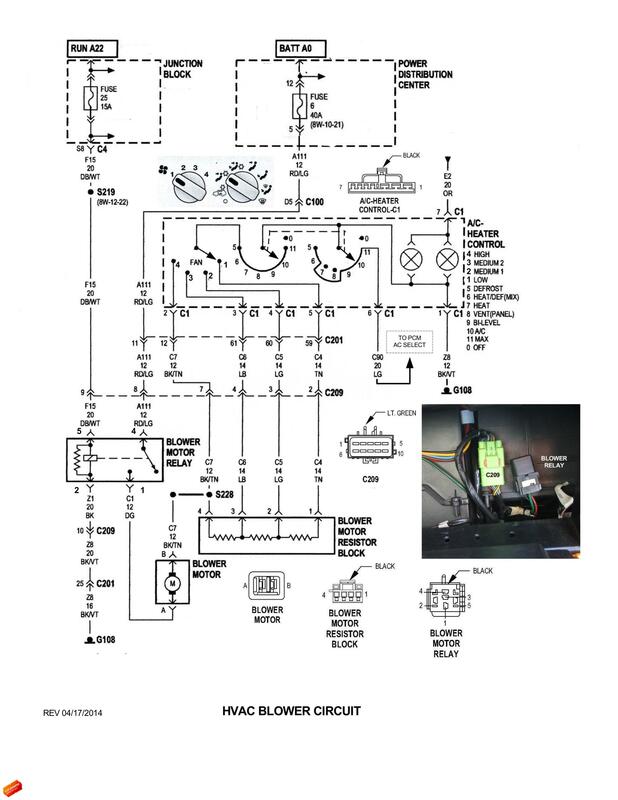 A wiring schematic for the 1999-2001 XJ Blend Air Door circuit. Last edited by CCKen; 09-30-2014 at 06:06 AM. This is not a How To post. Just some data for those interested in installing a temperature sensor for a temp gauge to monitor their AW4 fluid temperature. This data applies to AW4 transmissions up to 1997. 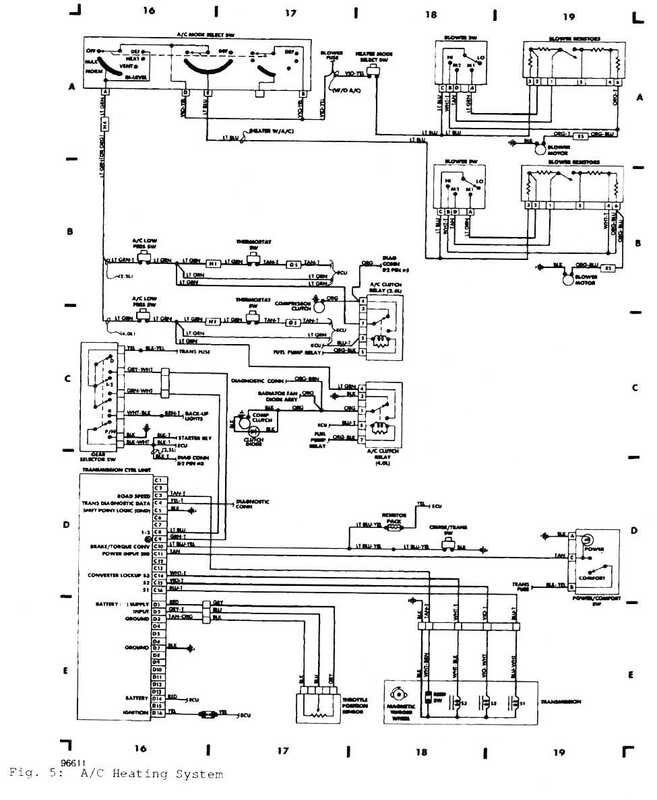 AW4 transmissions, starting in 1998, had the transmission case redesigned to accomodate an Input Speed Sensor, and in the process deleted the port described below. 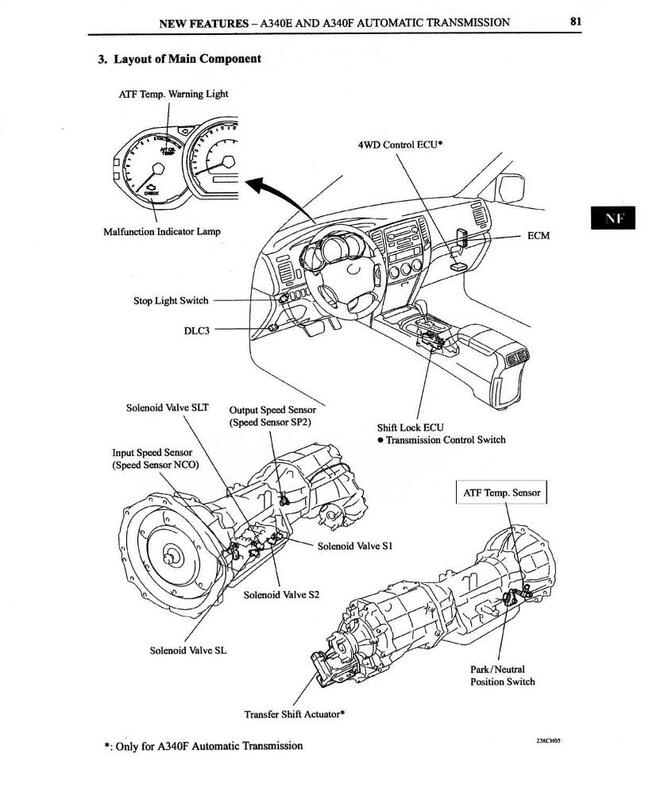 The A340 transmission had/has a port on the transmission for a temperature sensor installation (see pic below). 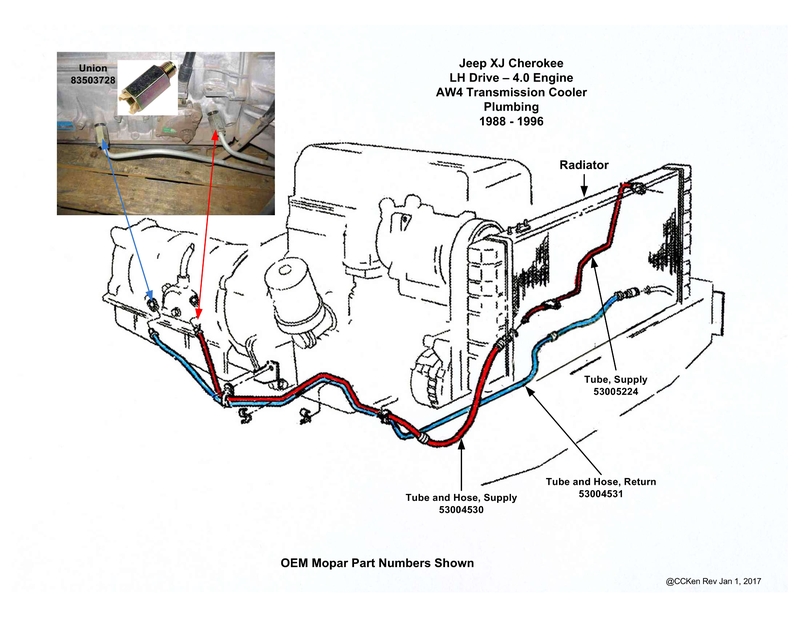 The pre-1998 AW4 transmissions has the same port but was not used for a temp sensor in the Jeep installations. 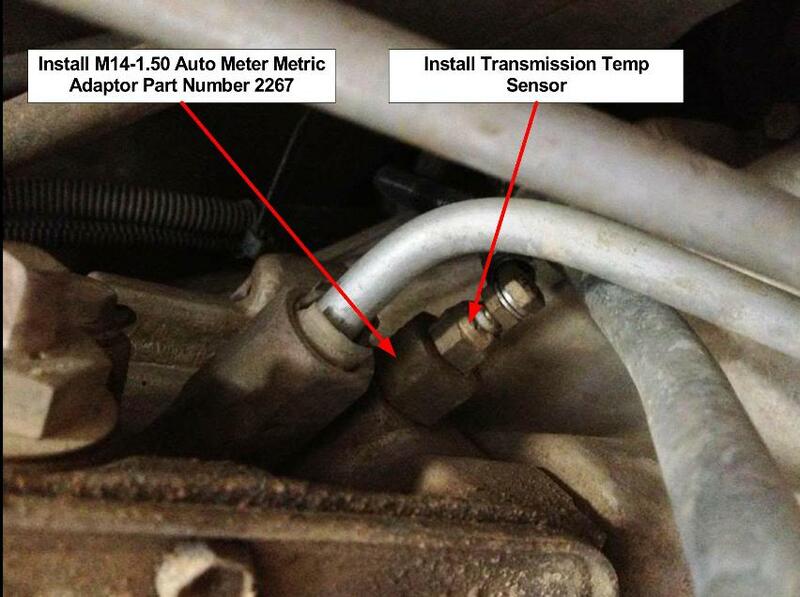 Pic of the temp sensor installation is from a thread on NAXJA. Guide to the location of the 1997-2001 ground points. G100. 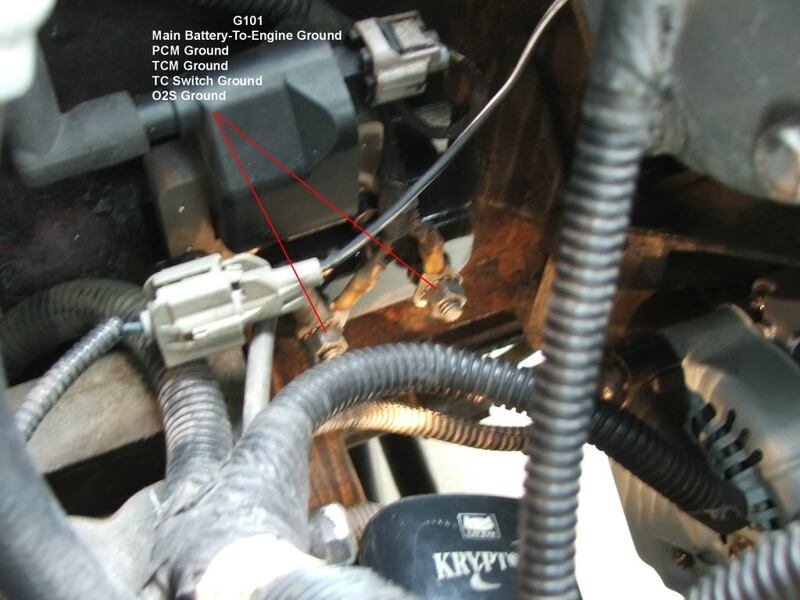 Main battery to chassis ground. G100 Rear view from inside of the right wheel well. Accessed by removing the right wheel well liner. G101. 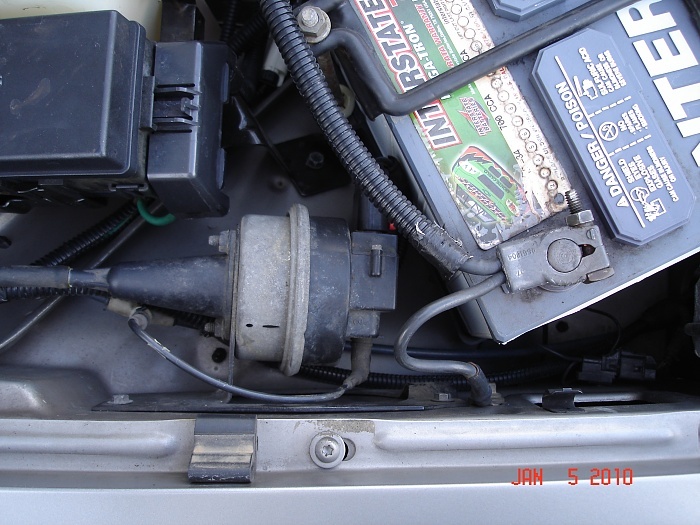 1997-1999 Ignition Coil shown. 2000 and 2001 at same location. G102. Ground for Data Link Connector pin cavities 4 and 5. 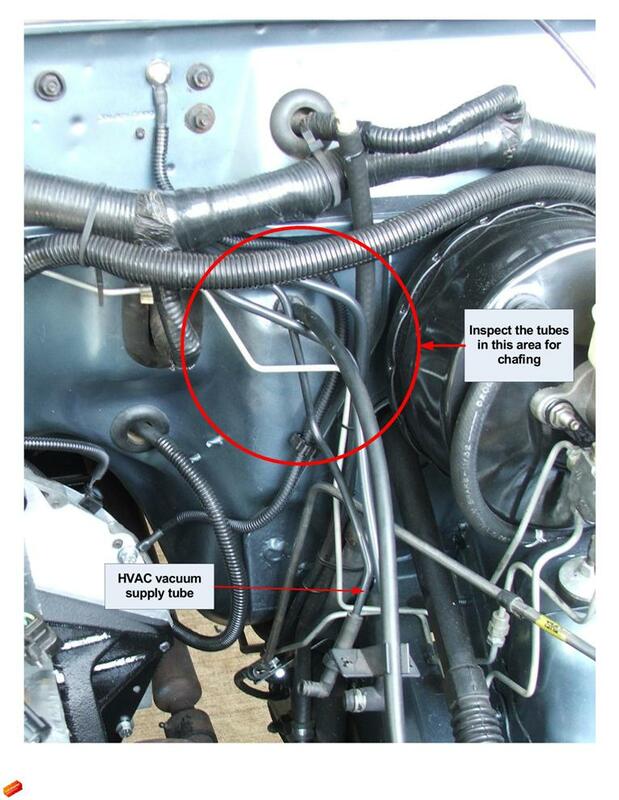 Located at the oil dipstick tube attach bracket stud. G106. 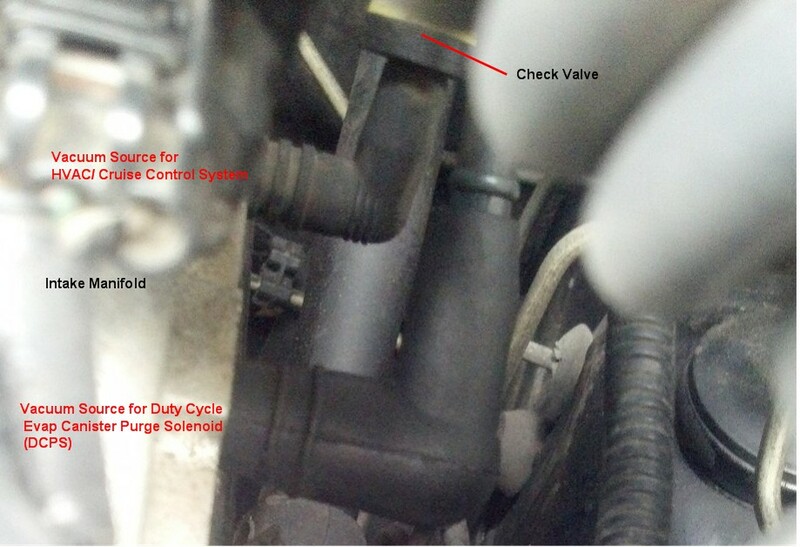 Located on left inner fender by the PCM and Air Filter box. 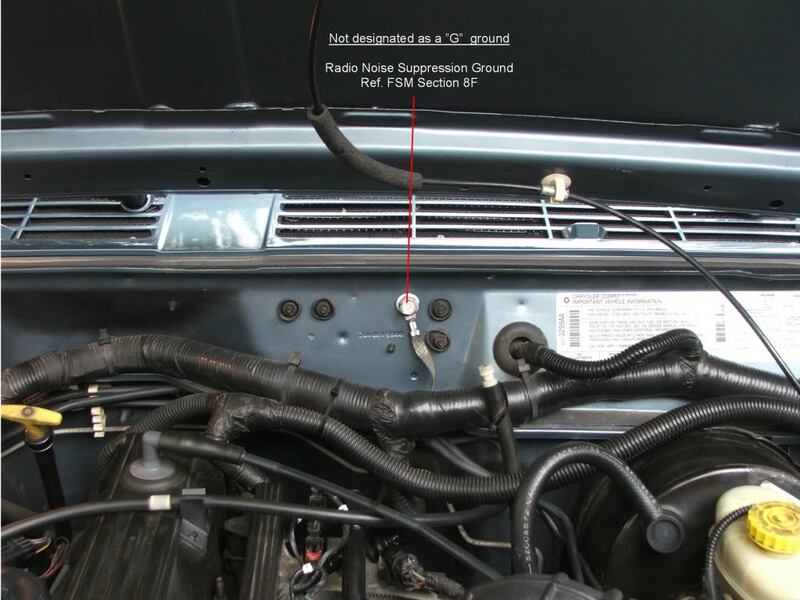 Firewall radio interferance noise suppression bonding strap. 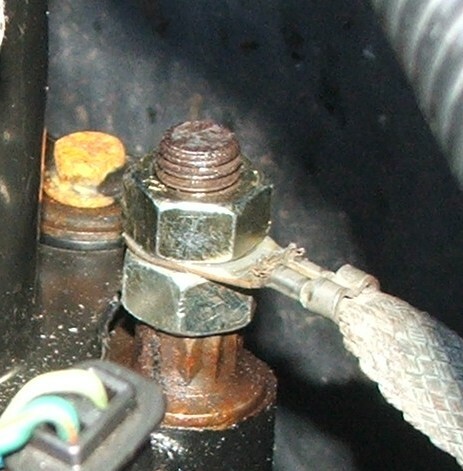 Firewall bonding strap connection on cylinder head bolt stud. Double nut configuration shown. 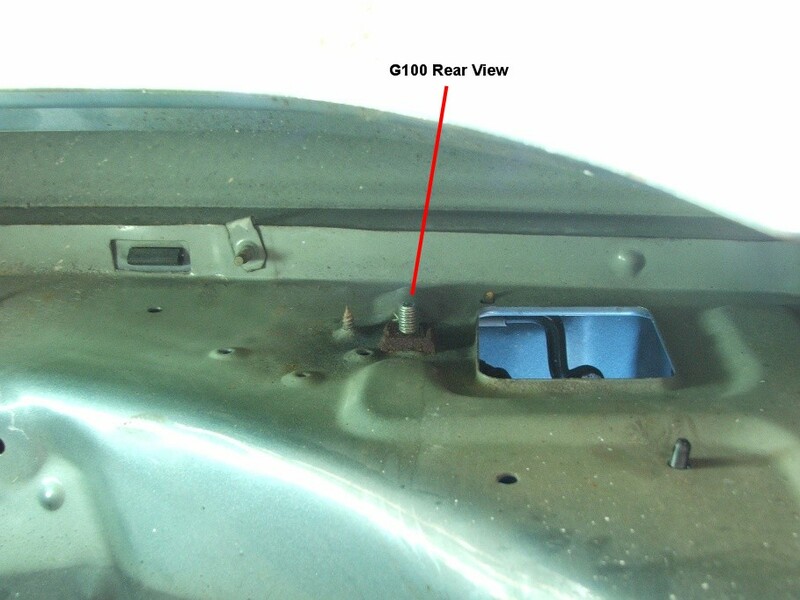 Located behind the spare tire mount bracket. Last edited by CCKen; 03-18-2015 at 08:09 AM. If anyone is looking for a Chrysler Sales Code, go to this list and look it up. 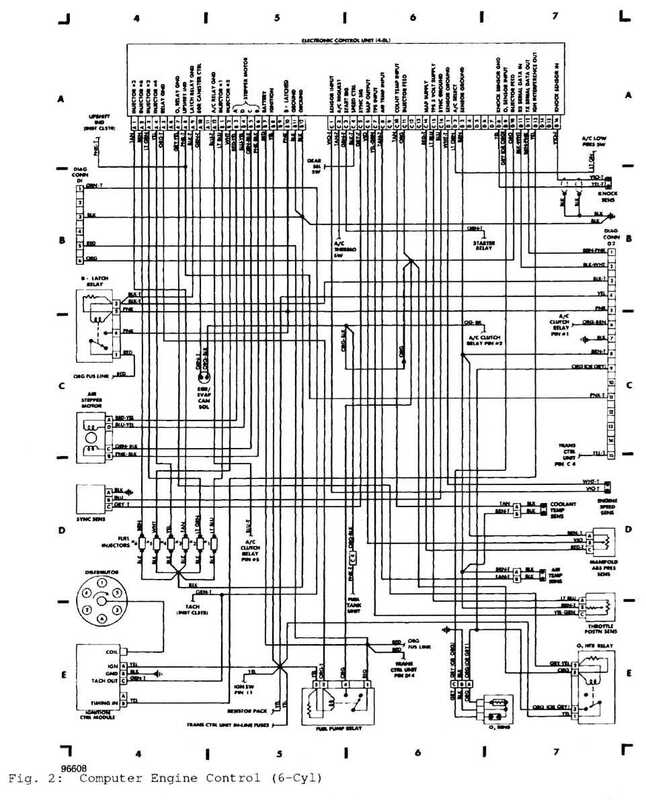 For each code it gives a brief explanation what the code includes. 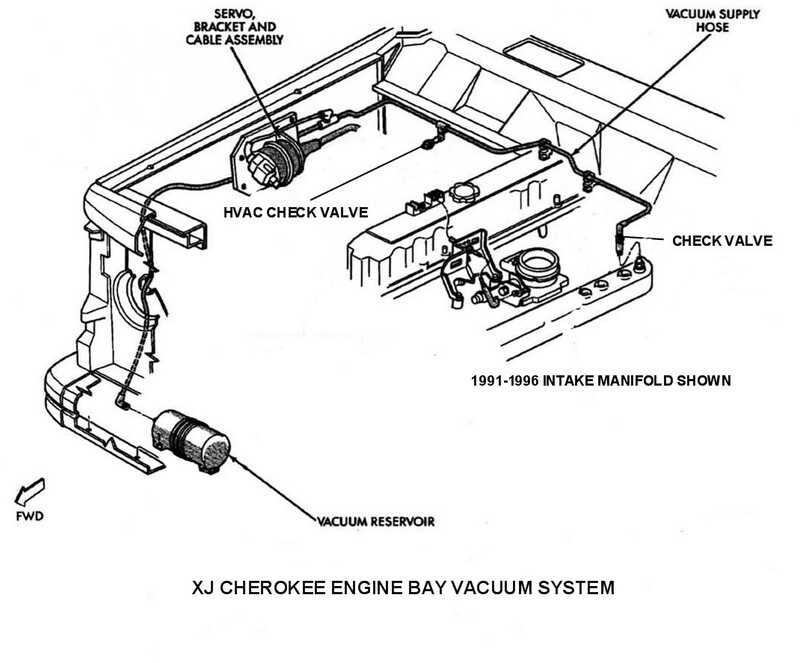 Illustrations of the engine bay HVAC/Cruise Control vacuum system. Last edited by CCKen; 03-18-2015 at 08:21 AM. 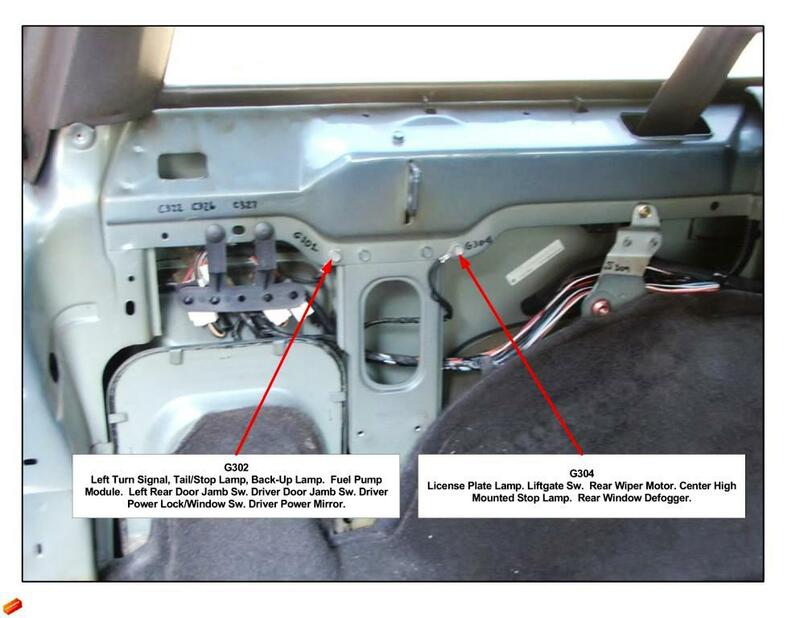 Good thread concerning damaged wiring in the Liftgate (Tailgate) in the linked thread, started by blazinbob. 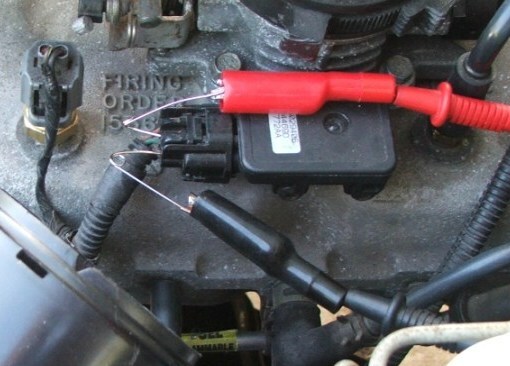 When doing electrical tests of sensors at their connectors, instrument cluster connectors, transmission control module connector, PCM connectors, etc., back probing or probing pin cavities is mentioned as the method. The following is recommended for back probing and pin cavity probing. Go to a fabric store and buy a varity pack of safety pins to use as probes. 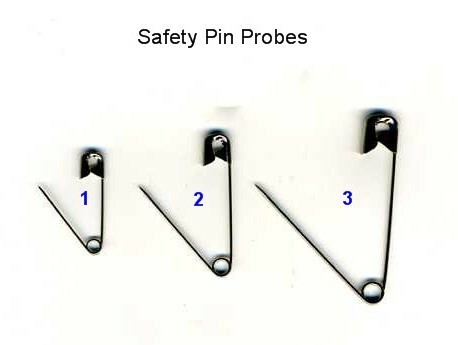 Shown are the three safety pins to use. #1 pin and #2 pin are used to probe pin cavities in connectors and #3 pin is used for back probing a connector. Example of probing pin cavities using #2 pins. #1 pins may be required for smaller pin cavities. Select the proper sze pin for the pin cavity. This is the Felpro Torque Specs Guide for head bolts. 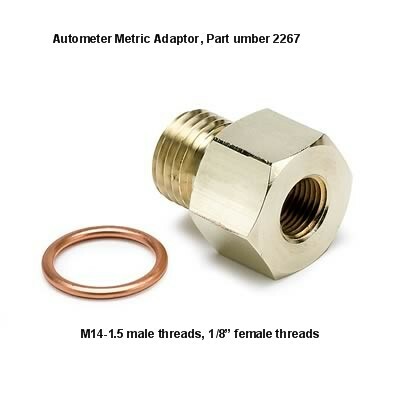 The Guide lists head gaskets, bolts, and other Felpro products, as well as the torque specs. 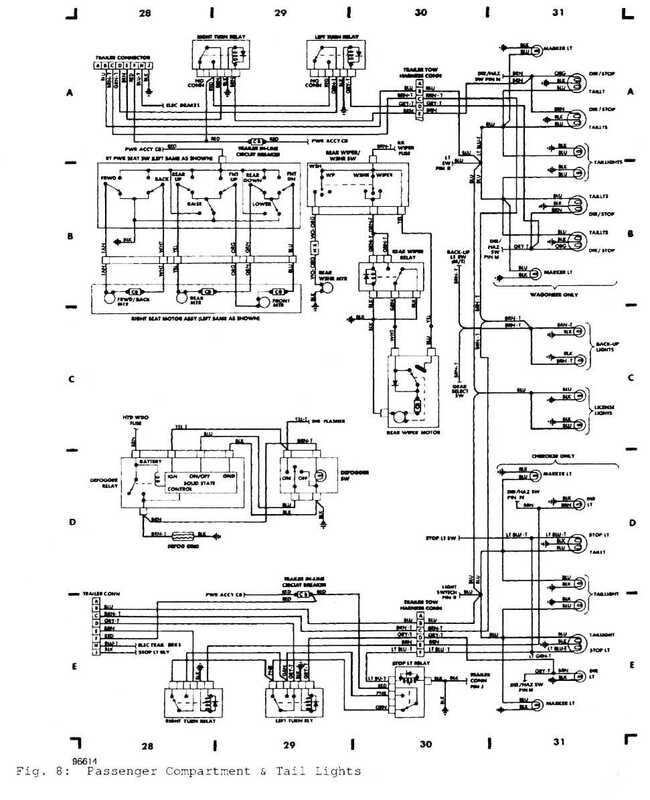 Wiring diagrams for the 1988 XJ. Really poor quality images but they may be of some value. To view the images closer press and hold the "Ctrl" key on your key board while tapping your "+" key. Tap the "-" to return to normal size. 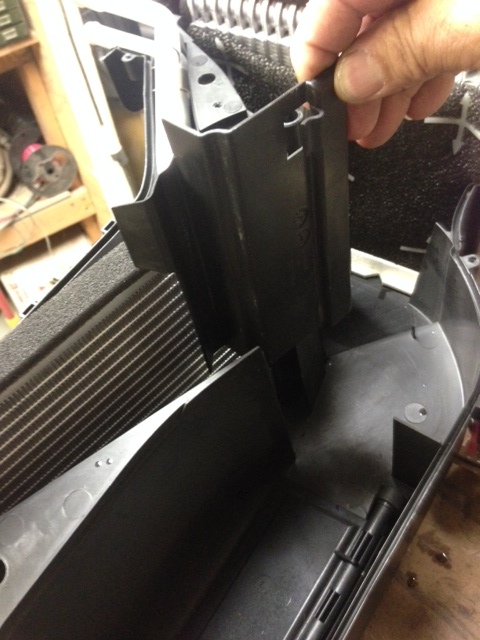 Ever had a part left over after putting your HVAC Unit back together and can't figure out where it should have gone? Great thread with alot of helpful info. Engine: 4.0L I6 "Power Tech"
This is actually my first post on the forum! I had an XJ in high school, and sold it because 1) I didn't know what I had 2) I thought I wanted a sports car ... Needless to say after a few years, I finally found and bought an 89 Laredo last week. I have been pouring over a lot of articles on this site to learn as much as I can about XJs to catch up on what I had missed out on. Anyway I was browsing google and ran across this gem from Cherokeetalk.com, and I haven't seen anything like it here so I figure I would share the find for people like me who are just now seriously getting into them. If it already exists or needs to be placed elsewhere I do apologize! Here is a quick and dirty FAQ list with answers, that you might find helpful. This mostly applies to XJ's or the Cherokee, but most will also apply to the cousin of the XJ called the MJ or Comanche. This is not meant to guide people to change, alter or modify any current setups, planned setups, or the way you do things. 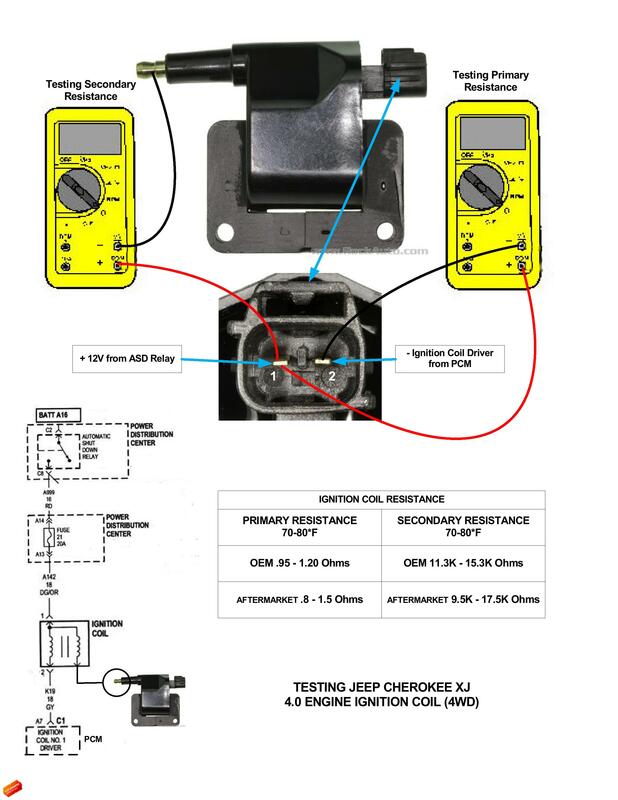 This is strictly meant to be a list of suggestions that has been gathered by people who feel their experience with these vehicles is enough to warrant posting such information to help out new jeepers or any person who is seeking answers to some common questions typically asked..
Why can't my XJ have a body lift? XJ's don't have a frame because they are unibody. In essence the body is a cage, which supports it's own weight. 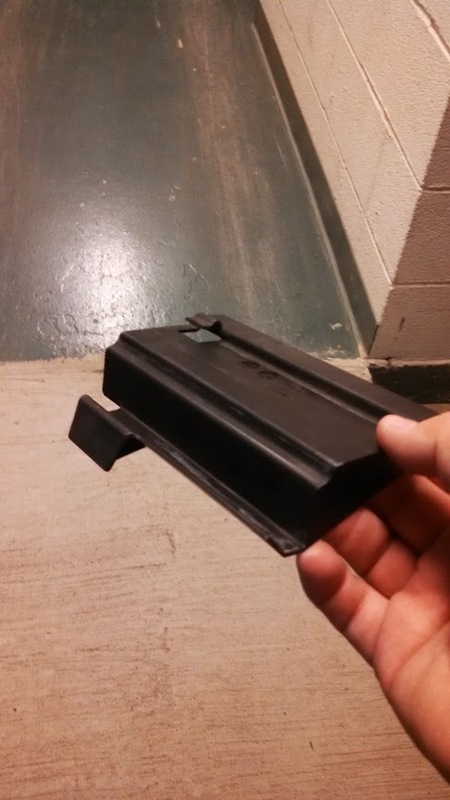 This is also why XJ's are so light. How can I mount tow hooks on the front of my XJ? In order to safely mount tow hooks on the front of your XJ you'll need either a larger, aftermarket bumper with pre-made tow points OR tow hook brackets. ** Use the proper mounting hardware with brackets that are professionally built, this very important. Nutstrips are metal strips with nuts welded to them. 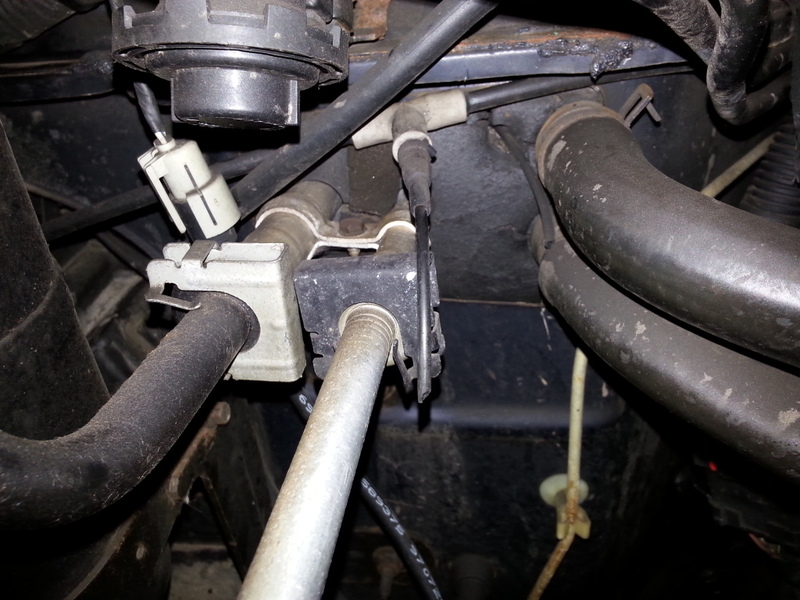 They are usually used for mounting rear tow hitches to XJ's. Why is my hood stuck shut?! 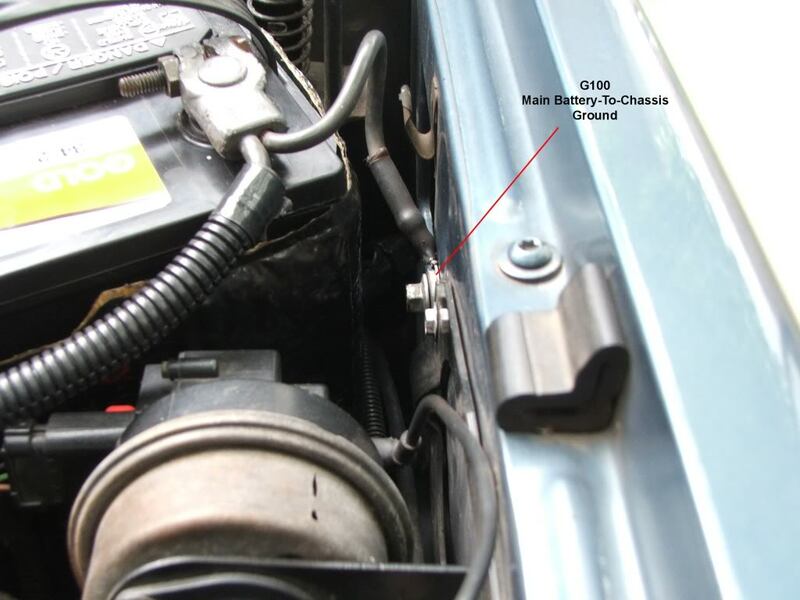 If not properly maintained XJ hood latches can stick shut because the release cable has broken or come loose. 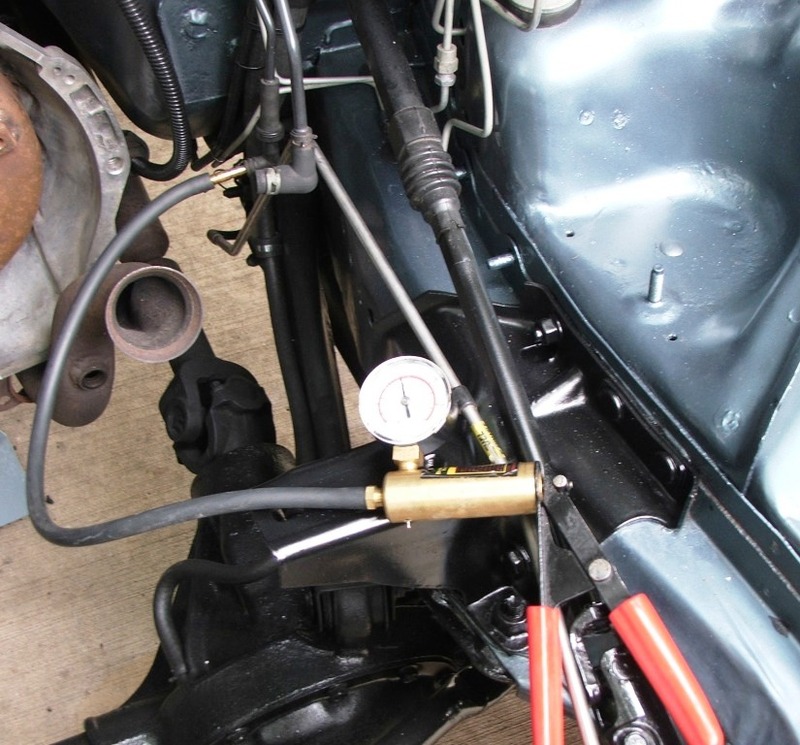 Short of cutting the sides of the fenders open, you'll need to crawl underneath and use some creative movement to grab the release cable with some pliers and pull real hard. 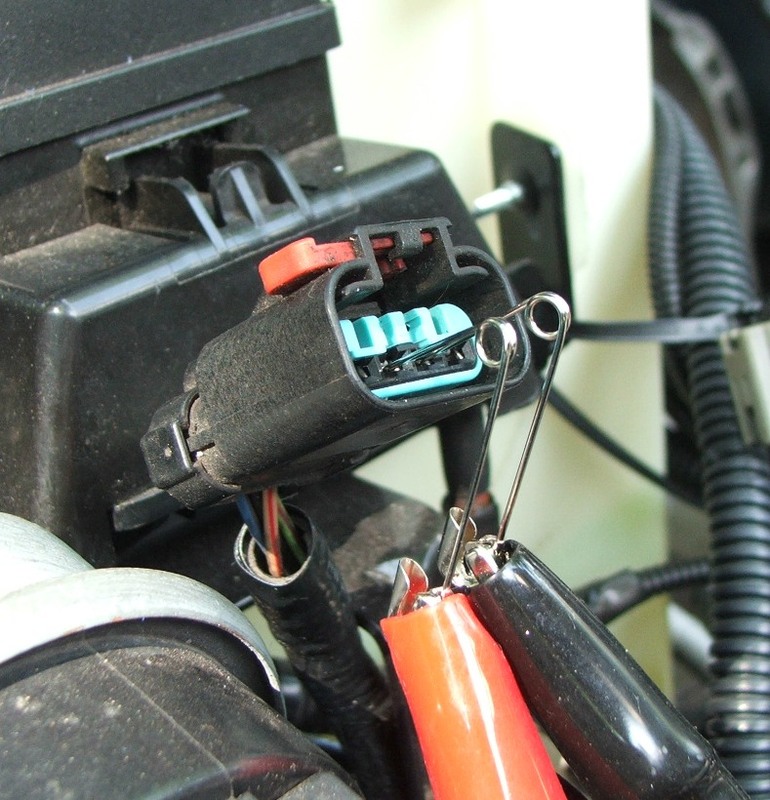 You can help prevent this by lubricating your hood release latches ever so often with WD40 or some spray-on lithium grease. 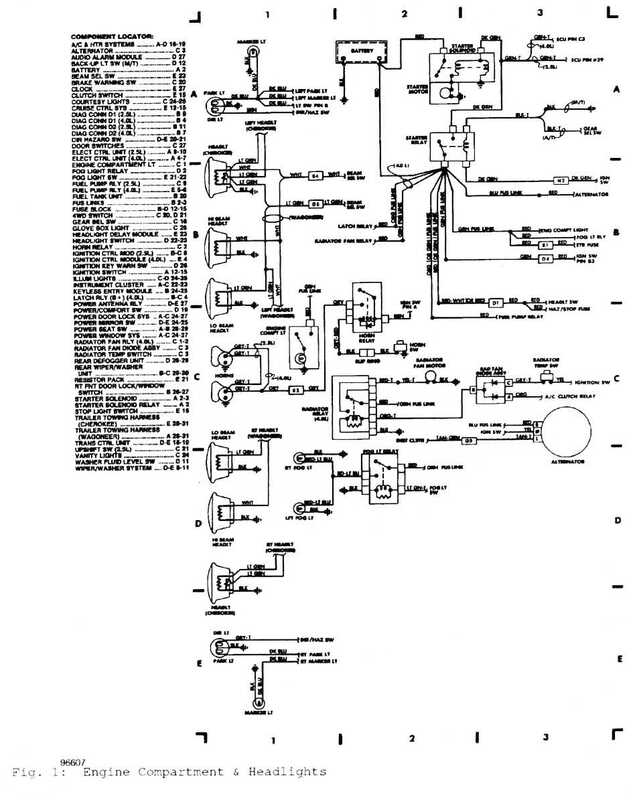 What transmissions came in the XJ? What axles came in the XJ? XJ's all have a Dana 30 axle in the front. What gear ratios came in XJ axles? 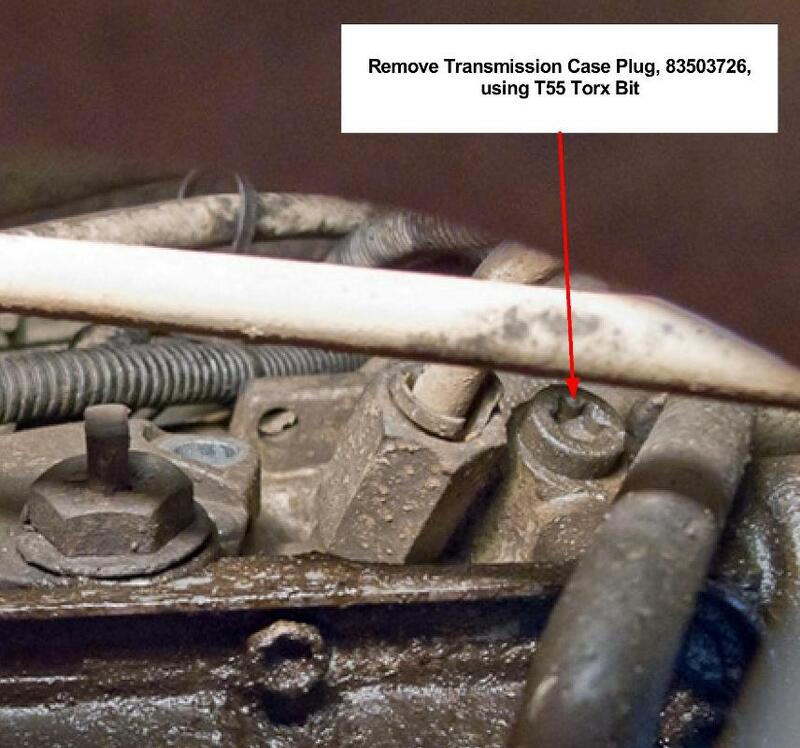 What's the difference between a 231 and a 242 transfer case? 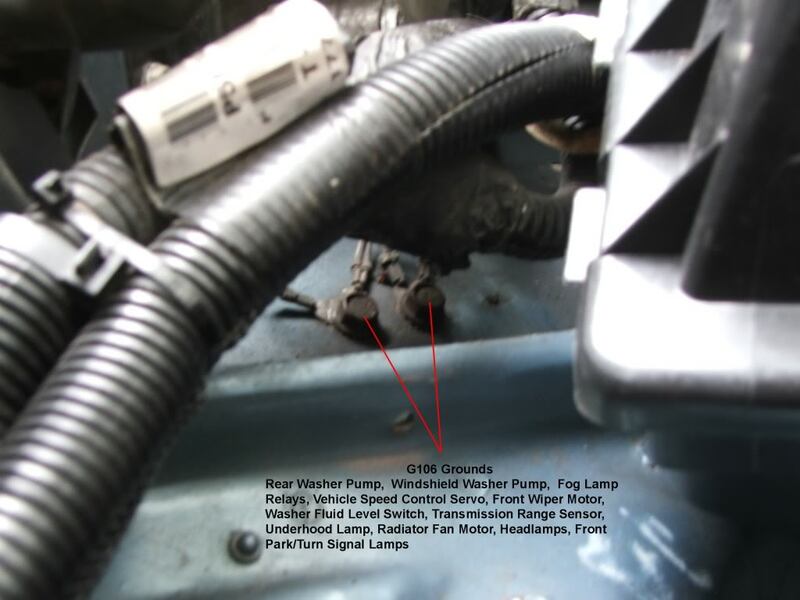 The NP231 transfer case (Command-Trac) provides 2hi, neutral, 4hi and 4lo. The NP242 (Selec-Trac) provides 2hi, full time 4 wheel drive, 4hi and 4lo. What's the difference between a locker and a limited slip? A Limited Slip Differential, or an LSD, is a traction aid that is most often clutch or gear driven. 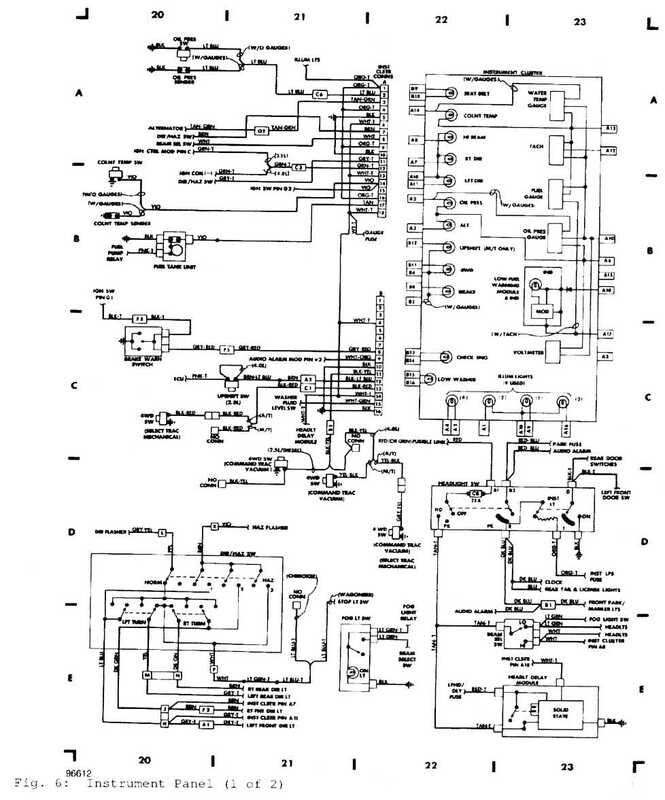 A simple explanation is that as a wheel starts to slip/spin the LSD detects this and transfers "some" power to the wheel that is not slipping/spinning. LSD's are usually fairly well mannered on the street. 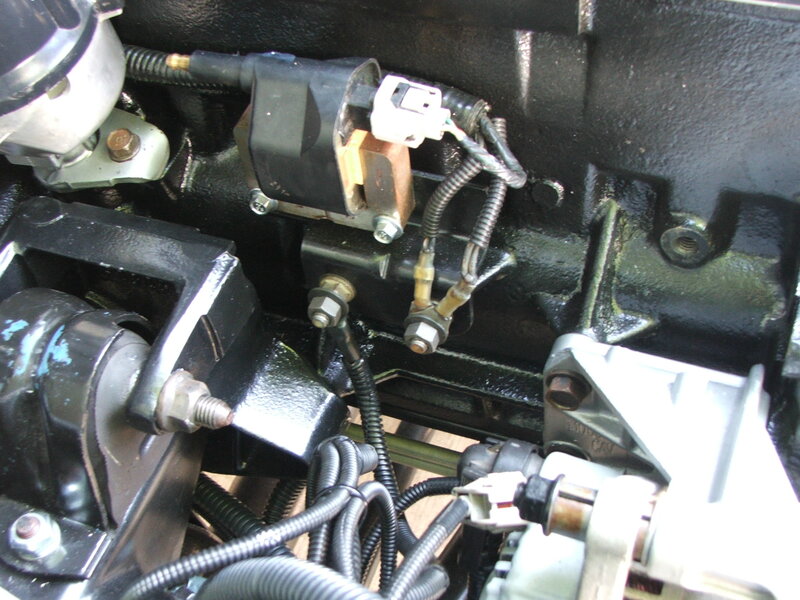 A locker, on the other hand, essentially locks an axle together for and allows full power to both wheels. Lockers usually have at least some negative driving characteristics when on the street. This is when the rotational force of the tires causes the axle housing to twist or rotate. This rotation forces the springs to bend into an S-shape. 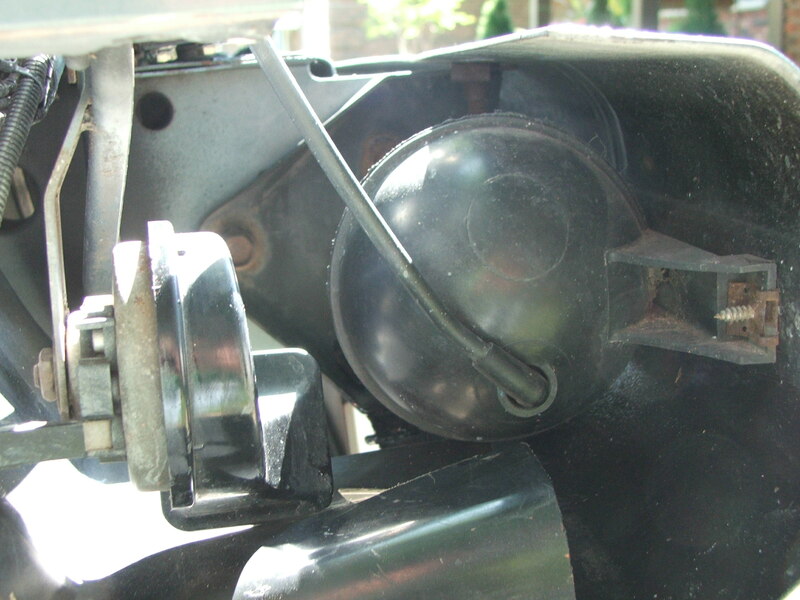 When the axle housing rotates far enough, forces cause the tires to loose traction, and jump, or "hop". Once traction is lost, the springs snap back into their original positions. 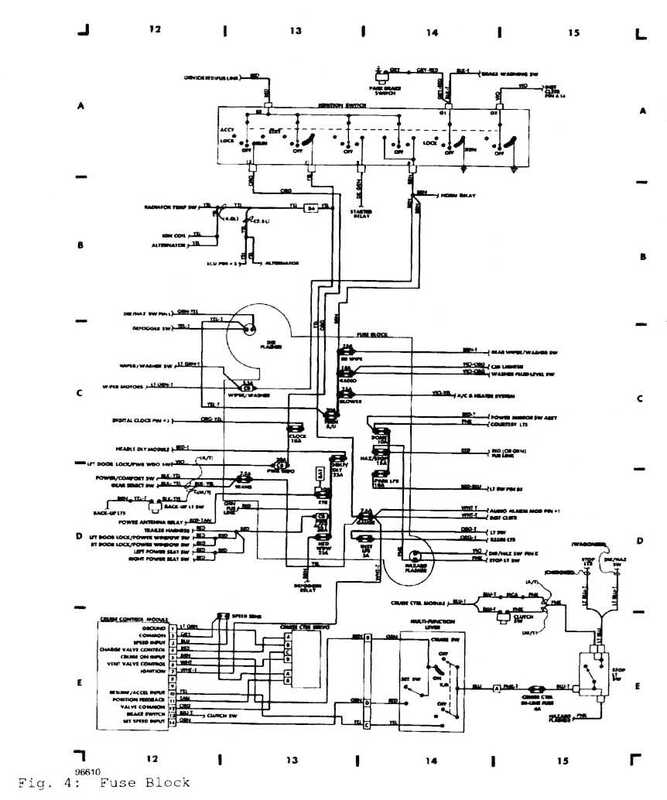 What engines did the XJ come with? Why does my rig overheat? XJ's are notorious for overheating. 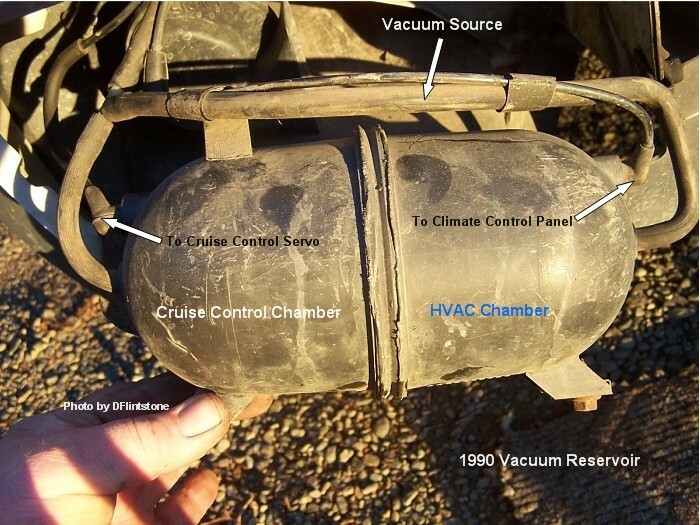 From early years until the early 90's they came with a "closed" cooling system. When functioning properly, these systems should perform fine. 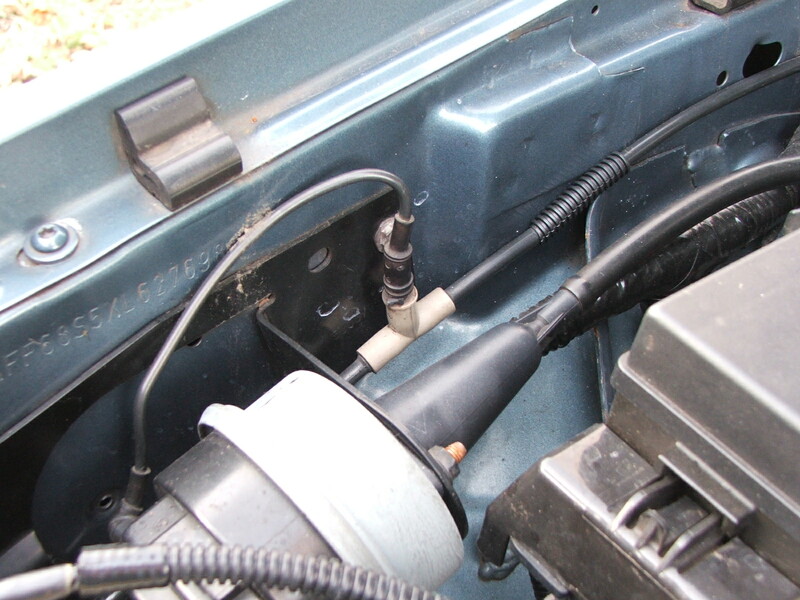 "Open" systems, on later model XJ's, are just like most typical cooling systems (filler cap on radiator, etc). 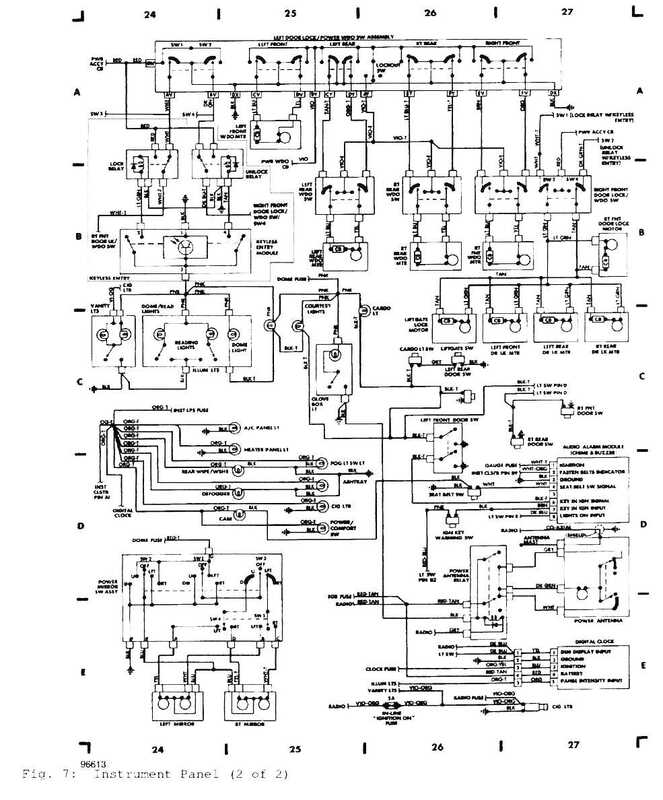 Why won't my Jeep start? On the 4.0, there are several things known for causing starting problems. The CPS, the TPS, and the NSS. Do a search on each of those. 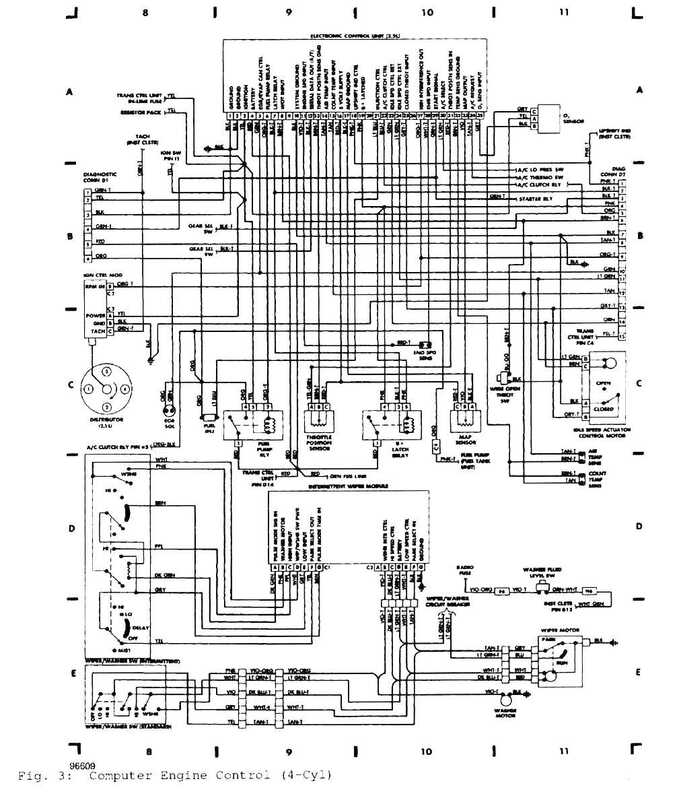 Why won't my reverse lights work? 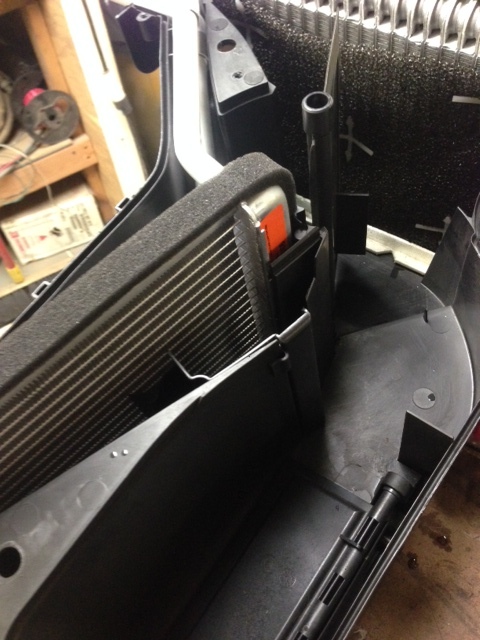 Why is there oil in my air filter box? XJ's commonly, over time, build up gunk in the PCV and CCV valves/lines and create pressure which then pushes oil into the air filter. 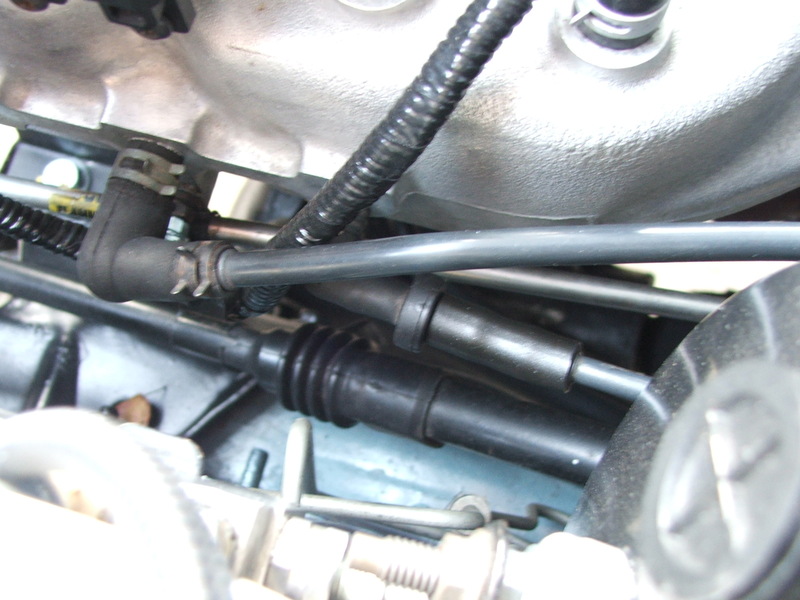 Replace these valves and lines (parts from the dealer) and the problem SHOULD go away. 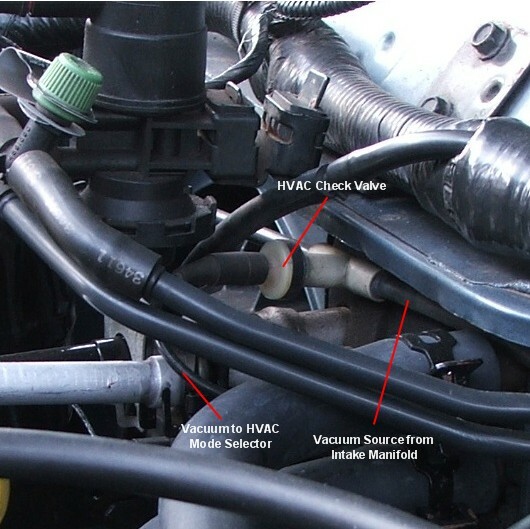 If it doesn't, you may need to clean the inside of the valve cover. What size tires can I fit on my Jeep? In addition to these guidelines, year must be considered. Up to 96 the wheel wells were generally more "open"…97 and later have a tighter front wheel well and are more likely to experience rubbing. Of course, virtually any tire can be fit with enough trimming. Typically most XJ owners don't go much larger than 35" tires, and that's at a minimum of 6" of lift. If your wheel backspacing is less than 4.75" (such as 3.75") expect to add at least an extra inch of lift. The distance from the inner edge of the wheel to the hub mount pad. Note: Sometimes the distance from the outer edge of the wheel to the hub mount pad is referred erroneously to as offset. BE CAREFUL! OFFSET - The distance from the centerline to the hub mount pad (where the wheel attaches to the hub). POSITIVE OFFSET - The hub-mounting surface is toward the front or wheel side of the wheel. NEGATIVE OFFSET - The hub mounting surface is toward the back or brake side of the wheels centerline. 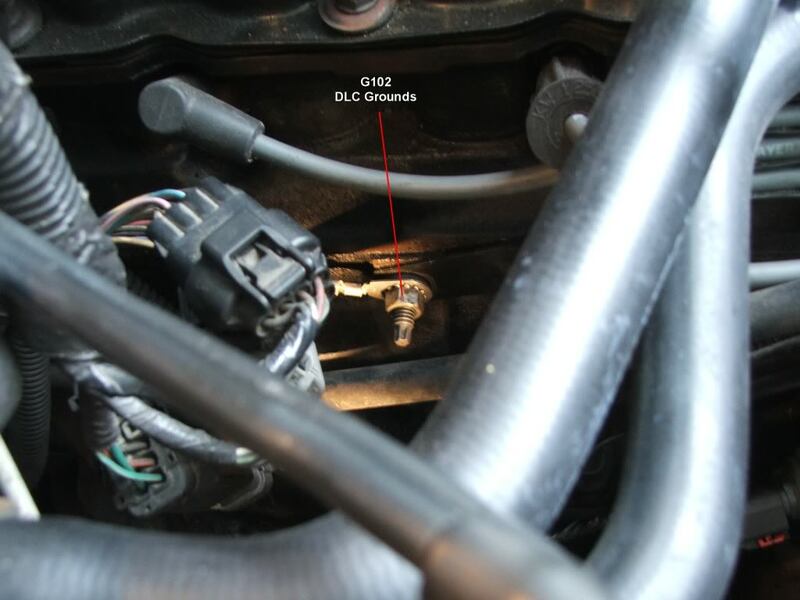 A slip yoke eliminator replaces the slip style yoke that came on almost all XJ's with a fixed yoke and (usually) a CV style drive shaft with a slip built in. 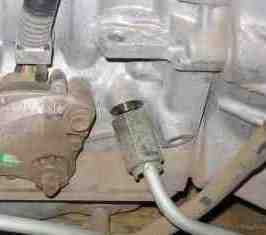 This reduces driveline vibes common with lifted XJ's and steep driveline angles. Typically, if you are over 3 inches of lift, you'll need an SYE. Now, that's just typical, not absolute. That is especially true for 1996 and newer XJ's because they have a longer output shaft. This puts more stress on the components and creates more vibes. Other options are transfer case drop kits and long travel slip yokes. These typically are more of a "band-aid" than a fix and can sometimes cause more problems in the long run. You'll know it if you experience it. 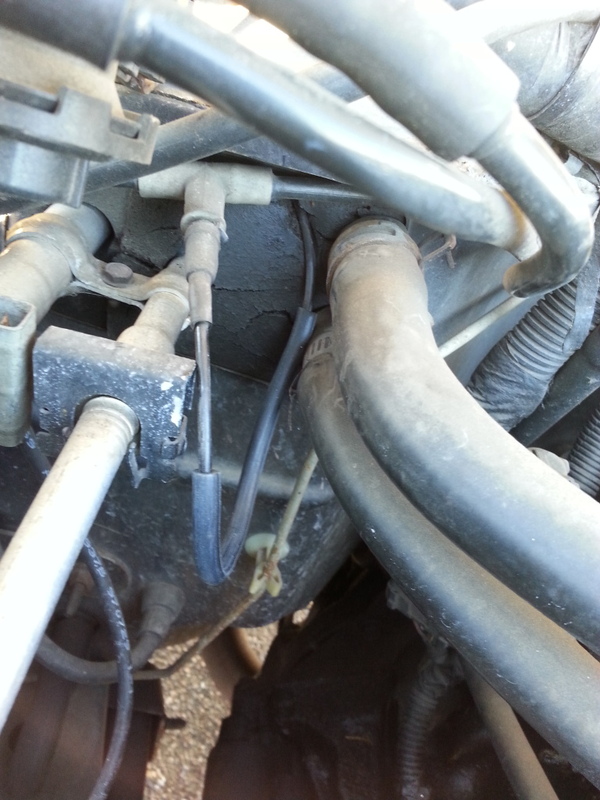 Death wobble is when your jeep suddenly, and violently, begins to shake back and forth. 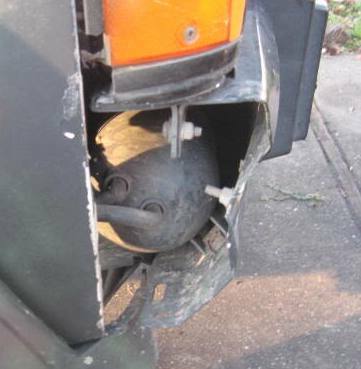 It often comes after hitting a bump, and USUALLY at higher speeds. It is truly frightening. This is not to be confused with tire shimmy, where the steering wheel gets a shake in it at certain speeds. A) Out of balance tires or out of round wheels. There are kits out there to correct the effects of high lifts, but usually it comes down to checking those 6 things. Tire shimmy is typically caused by unbalanced tires or out of round wheels. If it gets bad enough it's possible for it to deteriorate into death wobble. What is and causes bump steer? Bump-steer is the result of poor (and sometimes unavoidable) suspension geometry. The reaction is described as the vehicle steering off the intended track, on it's own (without driver input), when encountering a bump. Sometimes it is described by a driver as the vehicle needing constant direction correction whenever driving over a bump, "I hold the steering wheel straight but the vehicle steers to the right every time I hit a bump." 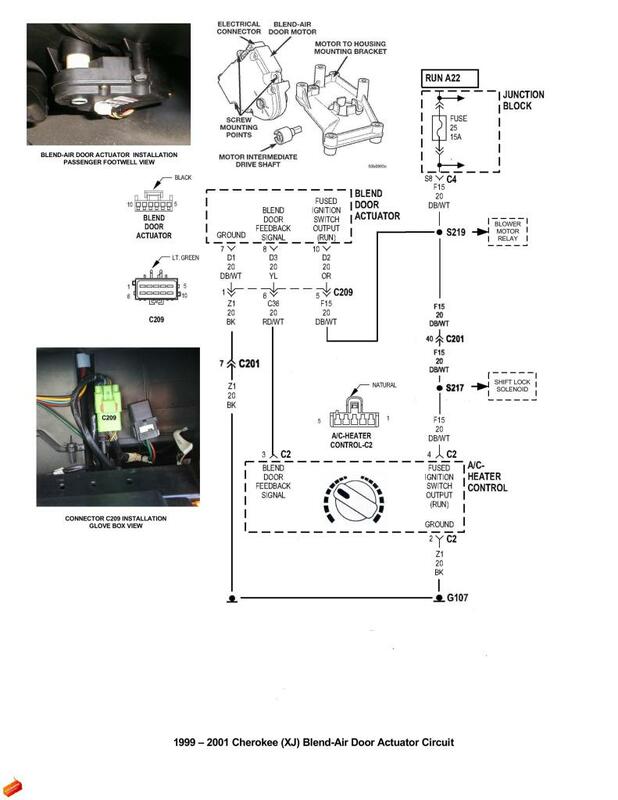 The cause is the axle tilt, due to the tire hitting a bump, changing the length between the axle draglink mount on a spindle and the pitman arm on the steering box. During a compression bump this length is reduced and the spindle must rotate (steer) to accommodate the draglink length.